Alex Ovechkin is using his fists to keep the Stanley Cup in the nation’s capital. 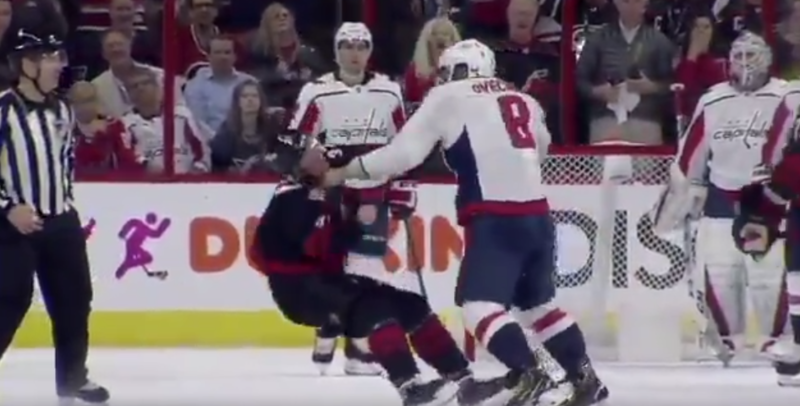 On Monday night, the 33-year-old future Hall of Famer got into with Hurricanes’ 19-year-old Andrei Svechnikov and it turned into violence as both players began to throw punches. It didn’t last very long as Andrei ended up getting dropped with a right hand as he fell backwards with his head smacking the ice. He would need plenty of assistance gettin up.